10 Via Bel Canto @ "The Village"
Luna Rossa Ristorante offers the perfect setting for private entertaining. Modern Italian cuisine and moderate prices have made Luna Rossa a culinary destination for over a half decade. 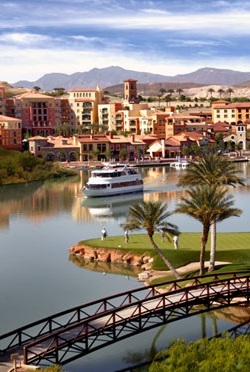 Adding a splash of Mediterranean color to "The Village" @ Lake Las Vegas Resort, with the vibrancy of a cosmopolitan restaurant, Luna Rossa's fresh, innovative cuisine complements any special event, be it a casual business luncheon or a formal wedding rehearsal dinner. We are an Italian family owned restaurant, and we offer an extensive list of authentic Italian menu options to suit your needs, as well as a flexible price per person. Our specialities include thin crust pizzas, daily homemade pastas, mesquite-grilled fresh fish, spit-roasted meats and fowl, and a glorious selection of desserts.